When I re-created this LOFT catalog photo, I wanted to kick it up a notch. 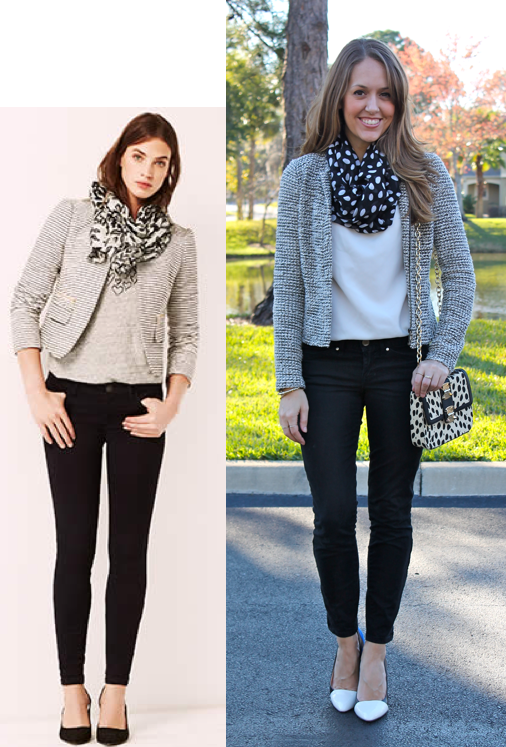 My scarf print has more of a contrast, and I added a patterned purse and colorblock shoes. Looking back I think plain black pumps might look better (the last photo without the shoes is my favorite), but thankfully there are no wrong answers in fashion, so either option works. What kind of shoes would you wear? Approx. dates: Jeans are 4 years ago. Scarf is 3 years ago. Top and jacket are 1 year ago. Shoes are last summer. Purse is recent. Speaking of shoes - I wanted to share some of my favorites from SJP's new shoe line! I am a huge SATC fan, and I think her line perfectly captures the whimsy of the show. It's a bit out of my budget ($300-500 range), but a girl can dream, right? Which pair is your favorite?